To quote Shrek for you all, “Layers. Onions have layers,” and that is exactly what makes them comparable to people. Some people live with many different layers underneath the surface, not expressing all of their qualities to the rest of the world. They might appear one way on the outside, but that is before you get to know them on a deeper level. You need to peel back those layers to really get to know what is inside. There are others who like to put everything on the surface, not possessing quite as many oniony layers as others. 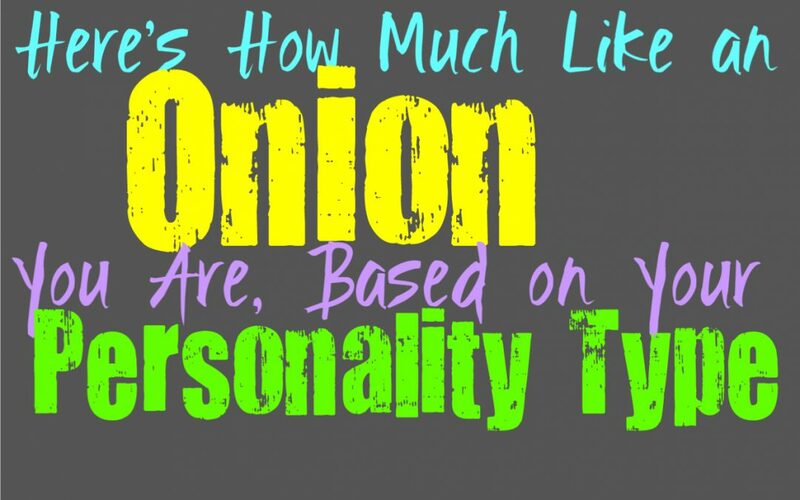 Here is how much of an onion you are, based on your personality type. INFJs definitely possess many layers of their personality, which can take a long time to uncover. They struggle to really open up to people, and keep most of themselves underneath the surface. Even when the INFJ begins to show parts of themselves, there is so much more to uncover. They are honestly the perfect example of an onion, possessing so many layers and so much depth. Even people who know and love the INFJ might not have completely been able to peel back each layer. This is something that takes time, as well as complete and utter trust. ENFJs definitely possess many layers to their personality, more than most people realize. They can appear friendly and open to most people, but that is because they want to connect with them. ENFJs still keep a lot of themselves inside, underneath many layers. They need to completely trust in someone in order to show these parts of themselves. They often appear different to people, because they respond based on how much they can reveal to that individual person. When the ENFJ does trust someone they will begin to peel back those layers, and this is frightening for them but certainly something that they desire. While INFPs can be afraid of shedding their layers, they still strive to be honest people. Their feelings and beliefs are often right on the surface, clear for everyone to see. They don’t want to hide these things, mostly because they can’t. INFPs cannot pretend to feel differently for the sake of someone else, and this is why those parts of their personality are easy to understand. While INFPs are open and honest, they still do possess layers within their personality. They will often be afraid to expose their deeper secrets to others, fearful that they might be judged. While they might have some layers to them, the thing the INFP wants most is to unveil all of the parts of themselves to someone they love. ENFPs often enjoy the concept of possessing many layers, and might even feel personally connected to the specific scene in Shrek (seriously ask them). They often feel like people don’t entirely understand who they are, even though they are open about a lot of things. While ENFPs are honest people, who dislike lying or hiding, it can still be challenging for them to completely peel back those layers. The ENFP who has been hurt in the past often keeps themselves in control and tries to hide behind these layers. When they meet someone they can trust it can still take time to truly expose their inner layers, but this is truly satisfying for them in the end. INTJs definitely have onion-like layers to their personality, more than they even realize themselves. INTJs are direct and straightforward people, but they possess a depth to them that most will never see. While INTJs are focused on growing their minds, they often have an artistic side that they don’t share with the world. Even deeper underneath those layers, the INTJ often has rather strong emotions that they struggle to understand themselves. They care about their loved ones in ways that they cannot openly express, which is why these layers can remain hidden for a long time. When it comes to the ENTJs goals and focus they can be rather upfront. While ENTJs might appear rather straightforward, they definitely possess many layers to their personality. While they appear simply focused on getting things done and taking care of business, ENTJs are deeply caring and loyal people. While they might not express their emotions in an open manner, this is simply another one of their layers. They have a hard time really exposing this to others though, and will struggle to even understand it themselves. INTPs definitely possess layers to their personality, so many that they struggle to feel understood by others. Their many layers can often serve as a protection in some ways, being fearful that if they expose too much it can lead to them getting rejected or hurt. INTPs appear to simply be focused on knowledge and learning, but deep down they are caring people who do want to be loved. When the INTP cares for someone it means a lot, and this part of them is not easily seen by others. They might learn to peel back these layers later on in life, or given enough time with someone they trust. ENTPs do possess layers, but they try to be as open as they can with others. When they are around someone they care for the ENTP does not want to hide behind these many layers. They try to connect with them and want to be able to feel understood as well. ENTPs can sometimes have outgoing and larger than life personalities, often using jokes to protect themselves from exposing their true feelings. For the ENTP the deepest layer is often a desire to find someone to love and understand them, while most people don’t ever get to see this hidden underneath the sarcasm and humor. ISTJs try to be as open and upfront as possible, which makes them appear less like an onion. Their goals and desires in life are often very apparent, and they aren’t afraid to be sincere about this. ISTJs also make it clear that they strive to work hard and provide for the people in their lives. While they do have many aspects of their personality that lay rather obviously on the surface, ISTJs emotions can definitely be hidden underneath. They have a hard time exposing these parts of themselves, making them more like an onion than people realize. ESTJs are less like onions, simply because their goals, beliefs and desires are made apparent to others. They aren’t afraid to make their intentions known, and don’t like having to pretend for the sake of others. They want to express themselves clearly and convey their goals without having to hold themselves back. ESTJs are who they are and they are unapologetic about it. The only thing that can be underneath layers with the ESTJ, is their inner emotions which even they struggle to understand. ISFJs definitely try to keep themselves honest and don’t like to appear like they are hiding parts of themselves. In truth there are layers to their personality that they don’t always expose to others. The reason the ISFJ will possess layers, is mostly because they don’t want to do anything that will disrupt the harmony. Exposing some of their inner feelings can cause them to shake things up in a way that they simply don’t feel comfortable with. They want to make others happy, and this is the ISFJs main and apparent goal. While ESFJs do possess layers like any person does, their main goals are pretty apparent and on the surface. They care about their loved ones and strive to protect them and make them happy. Most of their motivations, goals and focus, comes from a desire to please the people they love most in life. This causes much of the ESFJs personality and goals to be on the surface for the world to see and understand. There are still parts of them that they keep inside, often afraid to really peel back those layers unless someone makes them completely comfortable. ISTPs definitely do possess layers, often hiding most of themselves from the rest of the world. These layers can cause them to appear like a mystery to most people who meet them. ISTPs simply don’t find it natural to expose themselves or who they are to most people they know. It takes a lot for them to feel truly comfortable peeling back those layers, and this takes a lot of time and patience. The ISTP often isn’t fully aware of their inner layers, keeping their emotions bottled up most of the time. ESTPs are less like an onion than some types, since their goals and motivations can be rather clear. They don’t like hiding who they are or keeping things locked inside. Even when the ESTP tries to keep certain things to themselves, it often comes out naturally. While they aren’t completely emotionally expressive people, they are still rather upfront and open about who they are and what they want from life. While ISFPs possess rather deep emotions, they still struggle to really contain them. When they are around people they care for the ISFP wants to be completely open and honest. Hiding themselves feels insincere and really isn’t part of who they are. ISFPs would rather not have layers to themselves that they feel they need to hide from the world. Wearing their heart on their sleeves can definitely get the ISFP hurt, but it is a part of who they are. ESFPs are definitely less like an onion than most personalities, since they are so open and honest. They put their feelings out for the world to see, and don’t find it natural to hide themselves. ESFPs are who they are without really considering that they should hold back in front of others. For them it is nearly impossible to really contain their emotions, and they prefer to live with a sense of openness and honesty with everything they do in life.